So, if you play a top 25 team on the road, you're guaranteed at least two "Winning Points" (even if you lose! ), which is same number you get for beating a 101-200 team away from home. This approach is fairly obviously going to reward teams which have played more difficult schedules, regardless if they've actually won the games against these teams. And, wouldn't you know it, the focus of the article ends up being a comparison of Kansas and Wichita St., with Lunardi eventually "elevating the four-loss 'major' over the undefeated mid-major". Which was the inevitable result as soon as he posted that chart. In fact, it was pretty much a lock even before either of these teams have played a game. 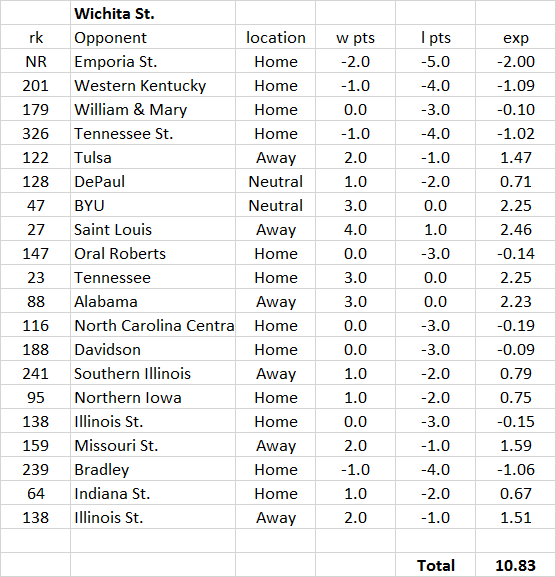 Below, I've used the current KenPom ratings/rankings to evaluate the chances Michigan (currently the #10 team in Pomeroy's ratings) would've had in each game on the schedules of the Jayhawks and Shockers. Combining that with the chart above, we get the expected "Winning Points" from the #10 team playing each of these schedules. Keep in mind, this is the result we'd expect if literally the exact same team played against these slates. Only three games with a negative expectation, versus eight where losing points wasn't even a possibility. Obviously Michigan is quite good, but you could put a team which doesn't fit that description (let's say Elon, #160 in KenPom) through this schedule and they'd still be expected to come out a couple "Winning Points" ahead (1.97, to be exact). Which makes sense; they're probably not going to win against Iowa St., but it doesn't even really matter, since they get two points just for showing up. Well, "Winning Points" sure doesn't approve of that home game against Emporia St. I mean, Wichita won by 43, but I guess that's just not good enough. In fact, the Shockers lose the same number of points for that result as if they'd lost on the road against a sub-201 team. 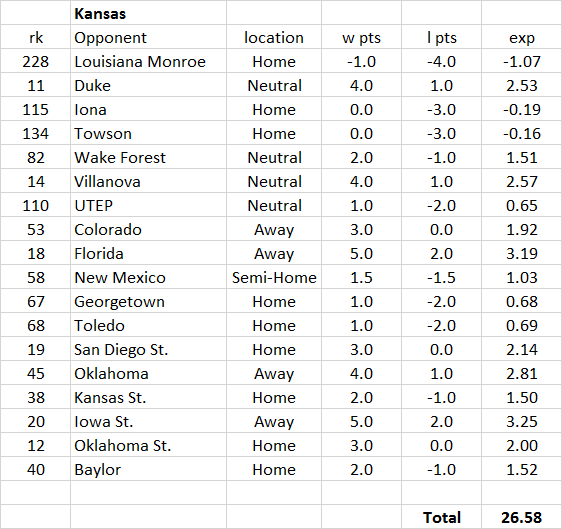 Before either team played a possession of basketball, Kansas had an edge of nearly 16 "Winning Points. Not because they had better players or anything like that; just by virtue of the teams they were scheduled to play over the season's first three months. As @BPredict pointed out, this is quite reminiscent of the RPI, which is like comparing an NFL team to the '08 Lions. Both these metrics give far too much focus to the difficulty of your schedule, and not nearly enough to your performance against it. Has Kansas faced a more difficult schedule? Yes, obviously. But it's not like Wichita is playing in the SWAC, and the Shockers' W/L results have been superior by a wide margin. Maybe they won't be able to keep it up, but as of now the undefeated mid-major's season has been more impressive -- if you ever gave them a chance in the first place.